The film then launches into the tale of Mary Webb (Hillary Brooke), a notorious con woman. It is an average day in New York City when Roger Kingsley (Tom Conway) walks into an insurance office and convinces Andrew Sheridan to hire him to track down Mary Webb. Mary’s been robbing Andrew’s clients of thousands of dollars, and rather than relying on law enforcement alone he agrees to hire Roger. Roger heads across the country to Los Angeles, where Andrew believes Mary is planning to pull a con job at a local department store. Roger finds Mary in Los Angeles… but he doesn’t apprehend her. What Andrew didn’t know when he hired Roger was that Roger is actually Mary’s boyfriend, and that he was planning to help her escape all along. Roger pretends she escaped without his help, leaving his LAPD connections in tact, which will help the couple pull off a couple more heists that Roger has planned. 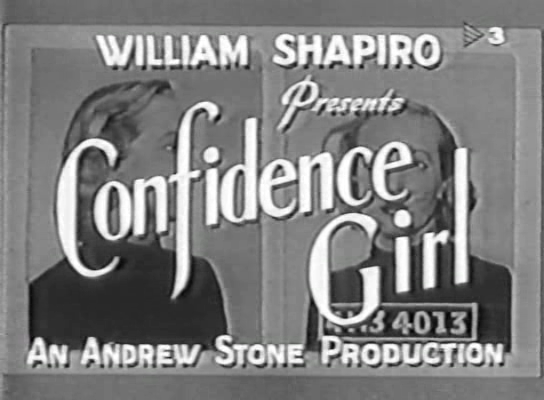 Confidence Girl was released in 1952 and written, produced and directed by Andrew L. Stone. The documentary narration that began in the film’s opening is peppered throughout, giving the viewer a sense that the film is half Hollywood cop drama and half real, behind-the-scenes peak into confidence schemes. The plot of Confidence Girl is engrossing enough. Complex scams are carried out, ans the complications that come along with them can be very interesting to watch. The viewer can’t help but think of how much intense preparation and planning must go into such schemes, and this reflective quality of viewing experience is only enhanced by the film’s storytelling style. Unfortunately, the film is not completely successful. It is, in a way, unbalanced. Tom Conway is a perfectly capable actor but he’s made to carry the film here — something he doesn’t seem completely capable of doing, at least not in this performance. Hillary Brooke, on the other hand, has a lot of charisma and screen presence but isn’t given much to do other than act as a pawn in the plans of her boyfriend. She is under-utilized and would have served better as the one to carry the film. Her character of Mary Webb is technically central to the film since the other characters are all either hunting her down or working on cons with her, but we get to see none of the masterminding that she seems to be notorious for, nor do we get to see much of an inner struggle in her between going “straight” or continuing in the con lifestyle with her boyfriend. Mary discusses her wish to stop pulling off schemes, but the film treats this confession as a small speed bumb in carrying out the con rather than using jt to explore the character further. Had the film been completely focused on Mary, her involvement in the crimes and that inner struggle, it would have been a lot more engrossing. She gets a couple of shining moments in, but throughout most of the film she isn’t given enough material to work with. And not only that…IT’S NOT SUITABLE FOR CHILDREN! A neat idea with a neat title…too bad it didn’t turn out to be a better film! Those “Not suitable for children” warnings pop up on the strangest films. Such a funny little product of the time. This film would probably be rated G today, haha!